Becoming a Certified Nurse Assistant in Missouri is an excellent way to start a rewarding healthcare career. A CNA has important job responsibilities in the delivery of basic nursing care services to patients and residents of long-term care facilities. The Certified Nurse Assistant works under the supervision of the Registered Nurse or Licensed Practical Nurse on duty, serves as the liaison between clients and medical professionals and plays a major role in helping clients achieve the highest quality of life. 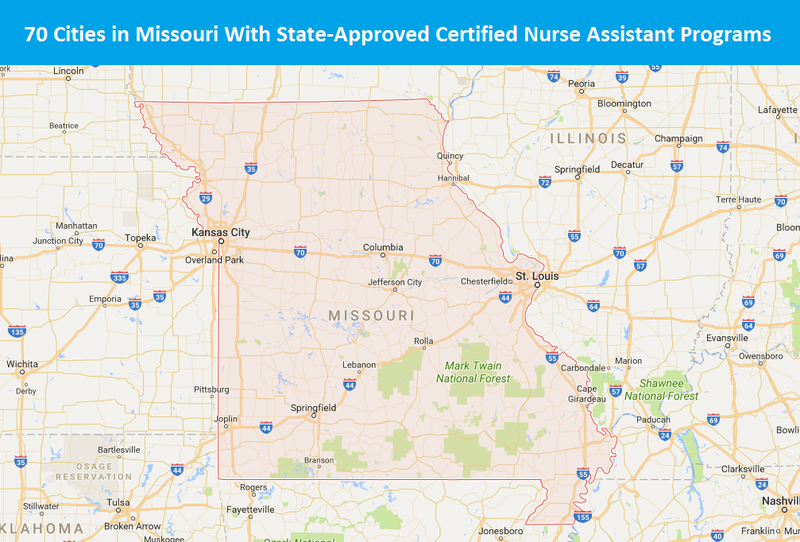 The Missouri Department of Health and Senior Services oversees the Certified Nurse Assistant training and certification requirements, and maintains the Missouri State Nursing Assistant Registry. A new CNA will have to complete state-approved training and take a state examination in order to be listed in the Registry. However, there are several other paths eligible individuals can choose among to achieve Registry listing. When an individual challenges the CNA exam, it means the person wants to take the Challenge Exam rather than complete a full training program which includes examination. Nursing students enrolled in a professional RN or LPN education program for at least four months, or those who have taken and passed a Fundamentals of Nurse Course within the last five years, can challenge the examination. Graduates of RN or LPN programs who failed to pass the state licensing exam can challenge the CNA exam. Out of state Certified Nursing Assistants who are in good standing on other state CNA registries can challenge the Missouri CNA exam. The person must be able to provide employer verification that he or she worked at least eight hours in every two years from certification. Verification is not needed if the out-of-state Registry has tracked employment. Students who completed a nursing program in another country can apply to challenge the Missouri competency examination. The applicant will first have to complete the orientation module of the CNA training course. The module covers topics like patient rights and safety. Individuals who trained in acute care units of medical facilities hospitals as nursing assistants can complete the orientation module of the CNA training course and show proof of completing 100 hours of training in a long-term care facility to be eligible to challenge the final examination. The same is true for individuals who trained as psychiatric aides. An individual who trained in a long-term care unit of a hospital and has been working in the unit for at least 12 months can challenge the final examination. It is necessary to first take and pass the training unit on resident rights and the care of confused residents. A person can only take the CNA Challenge Exam after the Missouri Department of Health and Senior Services gives approval via a Permission to Challenge letter. The letter is good for four months. 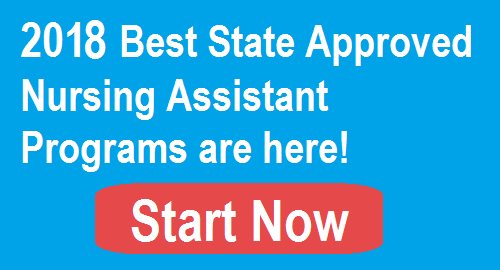 There are 100 state-approved Certified Nurse Assistant programs in Missouri that are offered in a large variety of educational facilities. They include technical centers, community colleges, technology academies, private agencies, hospitals, universities, and job training centers. They are offered in large cities and nonmetropolitan areas, so anyone interested in becoming a CNA in Missouri can find a local or nearby training program. The data is updated in August 2017. CNA classes in Missouri are structured in various ways. For example, Medical Education Development & Support, Inc. in Independence offers an eight-week CNA training program. It consists of 75 hours of classroom instruction and 100 hours of direct client care training. The Franklin Technology Center in Joplin offers a state-approved Certified Nurse Aide program, but it is a full semester long (approximately 12 weeks). The program also consists of 75 hours of classroom study and 100 hours of clinical training. However, the school also periodically offers a fast track session which requires a much shorter time frame to complete. Most locations in Missouri have CNA training programs offered in multiple facilities. Tuition and fees can vary widely from school to school. For example, Cox College in Springfield charges $1,600 for a six-week program which includes tuition, acceptance fee, drug screen, certification exam and criminal background check. Above and beyond this amount, the student will have to pay for textbooks, uniforms and supplies. Franklin Technology Center in Joplin charges $750 for tuition and fees. Nurse Aide students must pay separately for their uniforms, exam fees and supplies. Some schools in Missouri offer financial aid opportunities. State Fair Community College encourages students to apply for financial aid or A+ scholarship funding. The reason is that the school offers several options they call “stackable certificates and degrees.” Students who choose the Associate of Applied Science in Health Care Specialist with Emphasis in Nurse Aide may qualify for federal and state grants and loans. The other two options are a Skills Certificate in Nurse Aide and a Professional Certificate in Nurse Aide. They are certificate programs, and only state or private funding options, like scholarships, are possible sources of funding. Sometimes colleges partner with the state Training and Employment Agency to provide free or low-cost CNA training. For example, Saint Louis Community College-MET partnered with the Saint Louis Agency on Training and Employment to offer a no cost eight-week CNA training program. Another way to get free training is to get a job with a nursing home or long-term care facility within 12 months of completing training and passing the CNA certification exam. The employer will reimburse employees for training program costs. In addition, a person can work in a state-approved nursing home or long-term care facility for up to four months with being certified. The employer will pay all training costs, but the person will not be able to continue working after four months until certified. In Missouri, a student under the age of 18 but at least 16 years old can enroll in a CNA training program only if he or she is taking a high school health occupation course and can pass a criminal background check. Otherwise Certified Nurse Assistant students must be at least 18 years old. A Missouri state-approved CNA training program requires a minimum of 175 hours of attendance. There are 75 hours of classroom training and 100 hours of clinical training. The student is not considered as having completed the CNA course until a two-part examination is completed. Once the didactic and clinical training is completed, state law requires the person to take the CNA certification exam within six months of completing training. The two-part CNA exam consists of written and skills tests, and both parts must be passed. Testing is administered at approved training agencies which include nursing and long-term care facilities, vocational technical schools and community colleges. Usually, the student is able to take the final exam where training was completed. The written part of the examination is a multiple-choice test which asks questions about theory and knowledge gained during the classroom training. There are 50 questions, and the applicant must get at least 40 out of 50 questions right (80 percent). The skills part of the examination requires the student to perform nine skills in front of an evaluator. The hands-on skills are those learned in the laboratory and clinical training sessions. If an applicant does not pass either part of the exam, he or she is allowed to retake the part failed two more times. The retesting has to be completed within 90 days of the first failure. Otherwise, it will be necessary to retrain and take the full certification exam again. Once a nurse aide student completes a full training course consisting of theory classes, clinical training and the two-part final exam, his or her name is sent to the Missouri State Nursing Assistant Registry by the training facility. CNA certification in Missouri is valid for two years. Nursing assistants must renew CNA certification every two years (24 months) to maintain an active Registry listing. The CNA must work as a nurse aide for at least one eight-hour shift during the 24-month certification period in order to renew. When CNA certification is inactive, the person’s name is removed from the Registry listing. If unemployed as a CNA for less than five years, the applicant can challenge the final examination. If the person passes the challenge exam, his or her name is added back to the CNA Registry. After five years of CNA unemployment, it is necessary to complete a full training course and pass the competency examination. Individuals who meet certification requirements can work as a Certified Nurse Assistant (CNA) or a Patient Care Assistant (PCA). The CNA can work in hospitals, nursing homes, long-term care facilities, home health agencies, and as a private duty CNA.